★★★★★. Chimera is a fast-paced young-adult adventure that features a solid female protagonist and plenty of twists and turns. As a sequel, it does an excellent job of hinting at events that came before, without revealing too much. The Weregirl trilogy celebrates the release of its second title with overwhelming positive reviews. 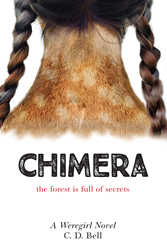 CHIMERA: A Weregirl Novel by C. D. Bell [Chooseco Publishing] follows last year’s release WEREGIRL with a powerful sequel. Weregirl, named Teen Vogue’s YA Must-Read of November, enthralled fans with the superhero origin story of high school athlete Nessa Kurland, whose wolf encounter on a nighttime run leads to her magical transformation into a weregirl. Weregirl broke sales records for Chooseco in its first weeks of publication, and talented YA writer Cathleen Bell was happy to continue working with the six-person team responsible for crafting the trilogy. CHIMERA sees Nessa elevating her werewolf powers, which become critical. She returns home from a run with her werewolf boyfriend Luc (sorry, you'd better read Weregirl #1 if you missed that!) to find Homeland Security stomping through her house and dragging her mother off to jail with no reasonable explanation. The forest is full of secrets, and Nessa Kurland is just one of them. The woods are crawling with corporate contamination and its dangerous cover-up, and Nessa learns her family’s story goes much deeper than the life she knows in Tether, Michigan. CHIMERA: A Weregirl Novel by C. D. Bell is available nationwide on Wednesday, November 1, 2017. For more about the Weregirl Trilogy and CHIMERA: A Novel, visit http://www.weregirl.com. Founded in 2003, Chooseco publishes the Choose Your Own Adventure series and WEREGIRL. Widely commended for its appeal to reluctant readers, the Choose Your Own Adventure series is the 4th bestselling book series of all time, with more than 270 million copies sold in over 40 languages. Each story is written from a second-person point of view, with the reader assuming the role of the protagonist and making choices that determine the main character’s actions in response to the plot and its outcome. Find out more at https://www.cyoa.com. When she's not biking the streets of Brooklyn, NY, you can find C. D. Bell writing in a decrepit RV clinging to the side of a hill in upstate New York, trying to teach herself to watercolor, or inventing her own recipes. She is a voracious reader of anything and everything fantasy, supernatural, or romance. And she swears that the monsters she often writes about are not real—at least she hopes not. Created by a talented team of six female writers and inspired by the ”writer’s room” of television, C. D. Bell is a Chooseco author pseudonym developed with teen author Cathleen Davitt Bell, who has written I Remember You [Knopf 2015], among other novels for young adults. To find out more about Chooseco, please contact Elizabeth Adelman at weregirl(at)chooseco(dot)com or by telephone at 802-496-2598. CHIMERA: A Weregirl Novel by C. D. BellIn CHIMERA, the second installment in the Weregirl trilogy, Nessa confronts the truth of who she is, where she comes from, and what she has to do to survive.